How Big Are Superdense Neutron Stars, Really? 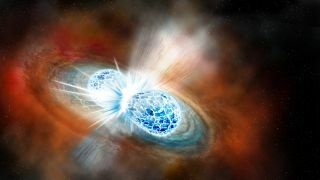 An artist’s illustration of two neutron stars colliding. Astronomers are getting a better handle on the densest objects in the universe. These bizarre bodies, known as neutron stars, are the corpses of stars that were once far heftier than the sun. Neutron stars generally pack between 1.1 and 3 solar masses into a space about the size of a big city, crushing pretty much all of their electrons and protons together to form neutrons (hence the name). On Aug. 17, detectors run by the Laser Interferometer Gravitational-wave Observatory (LIGO) and Virgo projects picked up gravitational waves — the ripples in space-time first predicted by Albert Einstein a century ago — emanating from the galaxy NGC 4993, which lies about 130 million light-years from Earth. In October, researchers announced that these waves were generated by a collision involving two neutron stars, which together harbored 2.74 times more mass than the sun. This marked an astronomical first; LIGO had picked up gravitational waves from black-hole mergers before, but never from a collision of neutron stars. Scientists using other instruments also spotted flashes of light coming from the merger, opening up a new era of "multimessenger astrophysics." Now, a team of scientists has performed computer simulations of the merger, modeling a bunch of different ways that it could have gone down in a new study that was published last week in The Astrophysical Journal Letters. Calculations based on these simulations help constrain the size of neutron stars. The results suggest that a neutron star harboring 1.6 solar masses must be at least 13.3 miles (21.4 kilometers) wide, study team members said. This number is not set in stone, the researchers stress; it will likely be refined as the LIGO and Virgo teams gather more and more data. You can read the new study for free at the online preprint site arXiv.org.